^ American FactFinder. United States Census Bureau. [2013-05-24]. （原始内容存档于2014-08-15）. 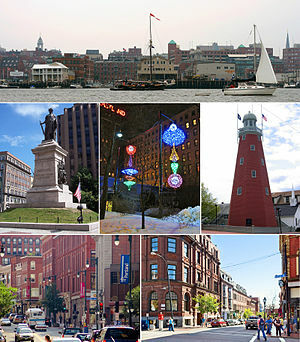 ^ Portland: The Town that was Almost Boston. Portland Oregon Visitors Association. [March 6, 2013]. ^ 12.0 12.1 12.2 12.3 12.4 12.5 NowData – NOAA Online Weather Data. National Oceanic and Atmospheric Administration. [2012-01-03] （英语）. ^ Station Name: ME PORTLAND INTL JETPORT. National Oceanic and Atmospheric Administration. [2014-03-13] （英语）. ^ Monthly Averages for Portland, ME (04101). The Weather Channel. February 2012 [2012-01-03] （英语）.